Some will say it’s too hard or that they have no time. Others will claim they have done their time or given enough. A brave few – a tiny remnant of those among us – will still do what they know needs to be done. Here is to Samuel Whittemore, aged 80. Alone, he attacked a British relief column and killed three British soldiers on April 19, 1775 near Arlington, Massachusetts. In the process he was shot in the face, bayoneted 13 times, and left for dead. When found, he lay in a pool of his own blood; trying to reload his musket. 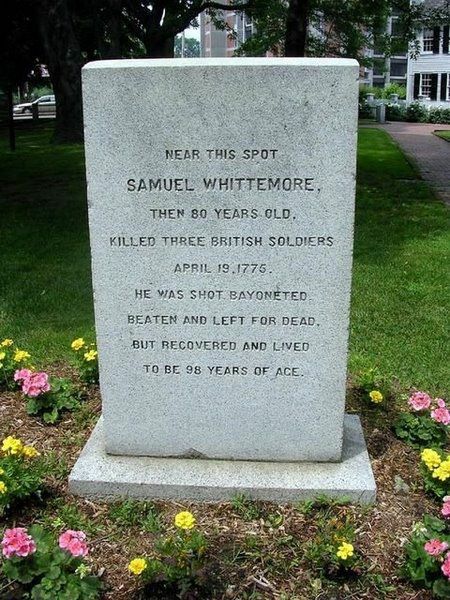 Out of what I would imagine is a pure stubborn refusal to allow the Redcoats the pleasure of his death, he recovered and lived to the ripe old age of 98. He is rightly honored as the Official State Hero of Massachusetts.